We’ve spent hours looking for the best microwaves, sifting through consumer reports, getting the thoughts of real users and putting our top picks to the test. After all this we think the Russell Hobbs RHM2362S is the best solo microwave for most people. If you’ve got a good budget and you’re in the market for more power, more capacity and more features then you might like the Panasonic NN-ST479SBPQ. And if you’re on a tight budget we really like the Daewoo KOR6L77. What is a Solo Microwave? 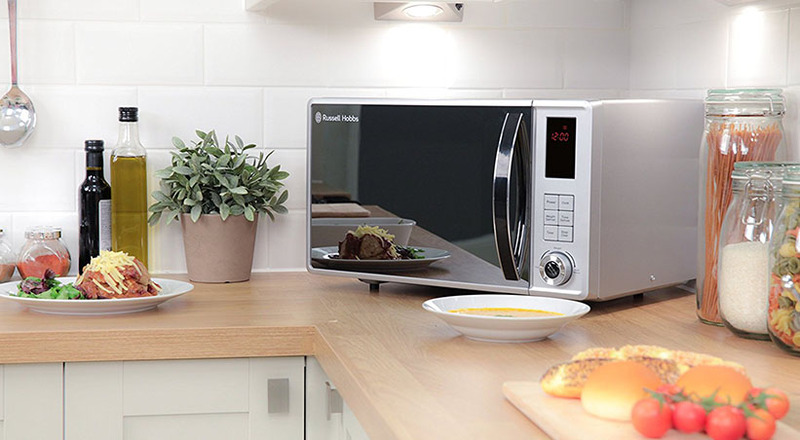 Solo microwaves are the most basic models and generally the cheapest with prices starting from as little as £30. Because they’re so basic, they lack the features of more advanced microwaves like grilling, crisping or roasting. That’s not to say they’re no good though. Solo models are useful when it comes to basic tasks like reheating and defrosting. If you spend a little more you can expect some pretty useful features including; cooking programs, turbo defrost and and auto-cook menus. There are also a range of power options available with higher powered machines being able to cook and defrost much more quickly and more evenly than their lower powered counterparts. 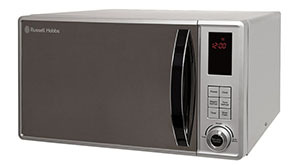 Other things you might want to consider when looking for a basic microwave include: capacity, style and noise. Capacity and style are common considerations but noise is often overlooked. If like many kitchens, yours is the heart of the home, you may spend a lot of time in there with friends and family. Some of the really cheap models can be so noisy they drown out a conversation, so you might want something a bit quieter. Solo microwaves work well for many people’s needs in the kitchen, especially when used with a conventional oven. With that said, it is worth knowing the pros and cons when compared to microwave grills or combination models. If you’ve decided that a solo model is the best microwave for you then there are literally hundreds of options to choose from. While this level of choice is definitely a good thing, it can make it difficult to choose. While a standard microwave doesn’t have a grill or convection oven, they can still come with a range of features. You’d be right in assuming that the best solo microwaves have higher power ratings. An 800 watt machine will cook your food pretty quickly, while a 900 watt model will do it even quicker. Higher wattage microwaves will also tend to cook food more evenly. There are 600 watt and 700 microwaves on the market but they usually fall in the budget range so we’d only advise you consider one if you’re on a tight budget or you’re looking for something with a stand out feature, like a small microwave. The capacity refers to how much interior space a microwave has and therefore how much you can cook at any one time. How you’ll use it – if you’re going be cooking with it regularly and have a large family then a larger capacity might be better. If you’ll only be using it occasionally to warm a bit of soup then go smaller. Even basic microwaves can come with a range of features like; auto-defrost settings, auto-cook menus, one touch controls etc. Think about what kind of features will make your life easier before making a purchase. Wouldn’t it be nice if your microwave actually looked good in your kitchen? Well, they come in a wide range of styles so it shouldn’t be too difficult to find something that fits in. All of the considerations above lead us to the price. Everyone likes to feel they’ve got a bargain and are often tempted by the cheapest price, only to realise that the product they’ve bought doesn’t have enough power, isn’t big enough or the quality and durability isn’t what it should be. A good price means value for money, not the cheapest. So in conclusion the ‘best solo microwave’ means different things to different people. The machine you choose is very much dependant on your own situation, lifestyle and cooking habits. This stylish model is an 800 watt machine with a 23 litre capacity. 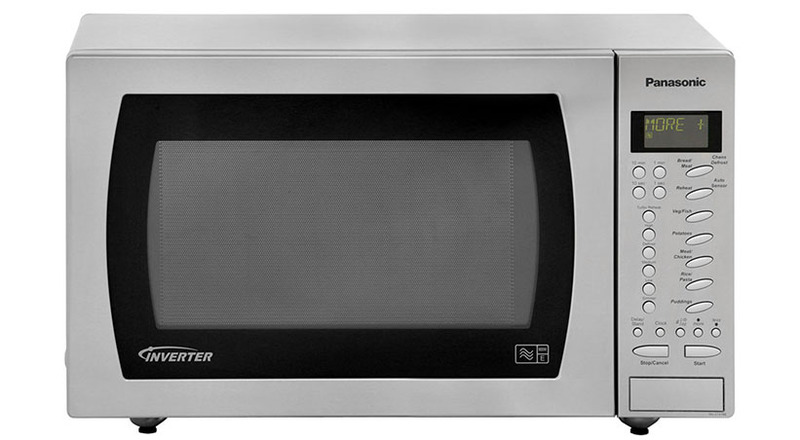 While it’s not the biggest or most powerful microwave out there, it is suitable for most families. It cooks food quickly and it will comfortably accommodate a 30cm plate. It comes with 5 power levels and has both automatic and manual defrosting options, allowing you to defrost by weight. It features some special programs including; reheating options for pizza and warm drinks, automatic cooking programs for meat and veg amongst others. You can also cook food in different stages, so for example, you can set the power at a lower level before increasing it to finish it off your dish. The controls are intuitive and it is easy to use and the digital display is clear. As well as looking fantastic, it’s super at heating your food quickly and keeping it moist at the same time so your lasagna doesn’t curl up and go hard at the edges. The defrost functions work well too. Some machines don’t defrost very well, with meat either coming out still frozen in the middle or starting to cook. With the Russell Hobbs RHM2362S you won’t have that problem because it defrosts very accurately. It’s energy efficient and relatively quiet too when compared to other models so you can hold a conversation while it’s in use. To a certain extent, user experience has been compromised for style when it comes to the reflective door. Because it’s reflective, you can’t see through it very well which makes keeping an eye on your food that bit more difficult. As a result you may have to keep opening the door to check your food. Some users have also complained that the reflective door shows up fingerprints and smears so you might need to clean it regularly to keep it looking nice. We think it’s better than OK and it seems that actual paying customers think the same. After all, conducting a test in a lab is completely different to using something every day as part of your life. At the time of writing, it scores 4.4 out of 5 stars on Amazon.co.uk from over 900 reviews. It’s not just on Amazon this Russell Hobbs microwave scores highly. It has been heavily reviewed on numerous shopping sites and scores very highly. 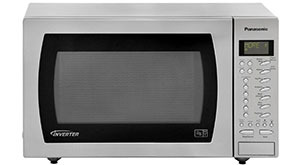 If you’re in the market for a basic microwave that has some handy features and looks like a high end, premium model, this microwave is well worth considering. It looks fantastic, works very well and doesn’t cost the earth. 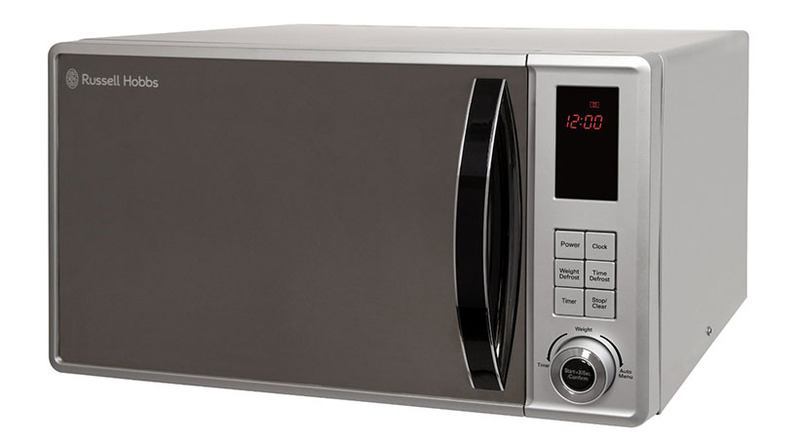 In our opinion it’s the best solo microwave for most people. This Panasonic microwave is a good looking machine with 5 power levels, the maximum being 900 watts. Coupled with its 27 litre capacity, it’s ideal for use in larger families and can accommodate a plate as big as 35cm. It comes with delayed start, sensor cooking and a whole host of cooking programs including 13 auto-cook, 3 defrost and 2 reheating programs so there’s plenty of options for cooking your meat, veg, soup and jacket potatoes. Microwaves are generally made for defrosting and reheating and the Panasonic NN-ST479SBPQ does this excellently. The defrost feature works really well. You can defrost by time or weight and it defrosts without leaving frozen spots or cooking other parts. In terms of cooking, it not only cooks food quickly but it cooks it evenly while not drying it out, which is something that can’t be said for many microwaves. It also features a large, clear viewing window so you can keep an eye on your food as it cooks. The stainless finish makes the Panasonic look fantastic but stainless steel can look a bit mucky when not polished regularly. Also, the door is opened using a button which needs a good, firm press. This microwave has been reviewed by Which? and has been awarded a ‘Which Best Buy’. People that use this Panasonic model every day also like it. At the time if writing it scores 4 out of 5 stars on Amazon.co.uk from 350 reviews. At around £130, the Panasonic comes in at roughly double the price of the Russell Hobbs but it does have double the features, it’s bigger and more powerful. If you’ll use the features and you have the budget we’d definitely recommend this as the best solo microwave. 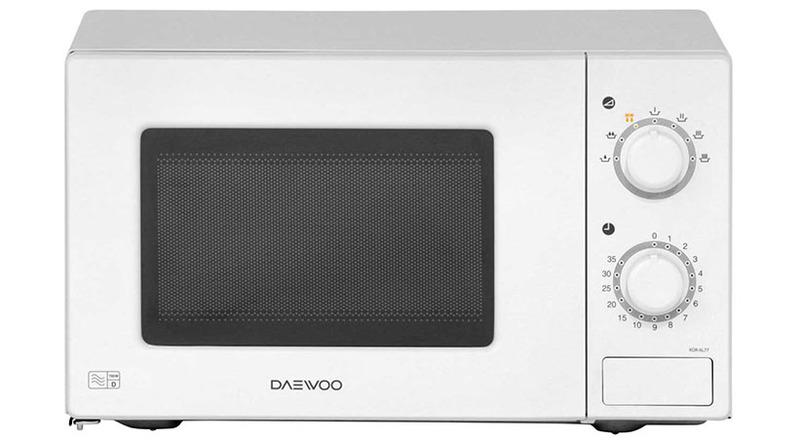 This model from Deawoo is a very basic microwave. It has a 20 litre capacity, has 5 power levels with the maximum being 700 watt and a 35 minute timer. If you want features auto-cook, auto-reheat or auto-defrost, this isn’t the machine for you. It really is as basic as it looks! Just because this Daewoo microwave is basic doesn’t mean it doesn’t do a good job. In fact, the things it does do, it does very well. Despite its maximum power only being 700 watts, it heats up a meal relatively quickly. The fact that the Daewoo KOR6L77 doesn’t have an auto-defrost might put you off. If that’s the case, consider the Russell Hobbs. It can also lose a bit of power if you’re cooking several meals in a row. This is quite common with cheaper microwaves and to shouldn’t be a deal breaker, just allow yourself a bit more time to cook. It also scores 4.4 out of 5 stars according to Google Shopping although this is from only 29 reviews. If you’re after something that has auto-cook features or other features like multiple sequence cooking then no, the Daewoo is too basic and you should probably consider the Russell Hobbs. If however you’re looking for some very basic and price is your main concern then yes, we think it’s the best solo microwave for you. The features are very basic and as we already said, the things it does do, it does very well.